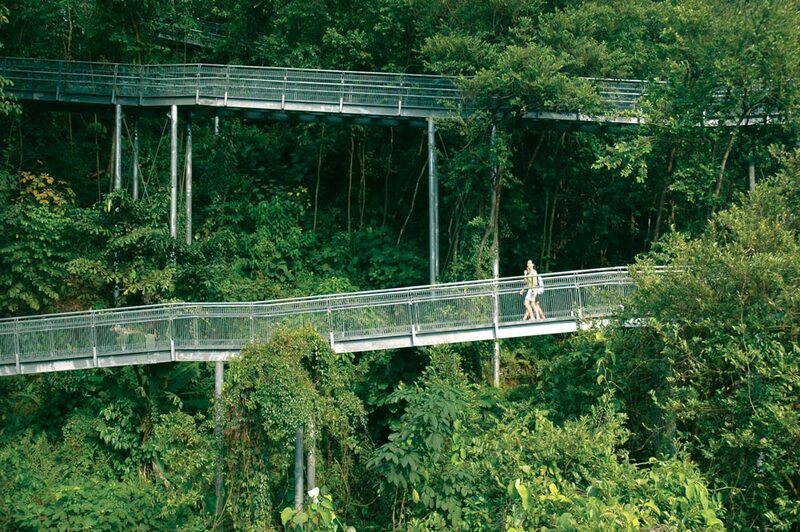 In Singapore, a bustling city-state with a population of more than 5 million people, residents float through the city on forest canopy walkways that connect the area’s important parks. The 125 miles of trails, walkways and bridges, known as park connectors, allow city-dwellers to easily commune with nature. Across the globe, professors, researchers and students at the UVA School of Architecture’s new Center for Design and Health study and assess Singapore and other cities around the world that are working to better incorporate nature into urban life. “We believe Singapore is one of the best examples of a biophilic, or nature-centered, city and, in turn, a healthy city,” says CDH co-director and professor of urban and environmental planning Tim Beatley (Arch ’79), who leads the center’s Biophilic Cities Project. Beatley’s team’s research is just one of many projects at the CDH, which was founded in 2011 and studies ways to improve the design and planning of buildings and environments for human health. The center’s research is international in scope and examines various 21st-century challenges, such as environmental pollution, an aging population, increased poverty and the need for preventative medicine. On nearly every level of society, architecture and design can affect well-being, say Beatley and CDH co-director Reuben Rainey (Arch ’78), whether it’s on the macro level of city planning, or in smaller settings such as school cafeterias or the interior of the dreaded physician’s examination room. There was a time in the last century when most medical facilities looked the same. The interiors were bland and sterile looking, absent of character. In those days, practicality came first; aesthetics were an afterthought. When lying on his or her back while being treated in the Tomo Machine, a patient sees a simulated sky. At the Emily Couric Cancer Care Center, access to natural light is strongly linked to improved immune systems and reduced stress. Today, architecture and design have become forms of medicine when it comes to the health care world. Over the years, research has shown that there is a strong correlation between a patient’s health and the environment he or she is in. When designing a hospital, certain factors once considered merely aesthetic became crucial, such as allowing patients an opportunity to be exposed to natural light. Looking at where things stood just a half-century ago, Reuben Rainey, who is a faculty member in the department of landscape architecture, notes that medical facilities have come a long way when it comes to recognizing the importance of design. Rainey says that there are myriad factors to consider when designing a building for its possible impact on health, citing the watershed 1984 study by healthcare design researcher Roger Ulrich that showed how a patient’s view of a natural setting can improve recovery. 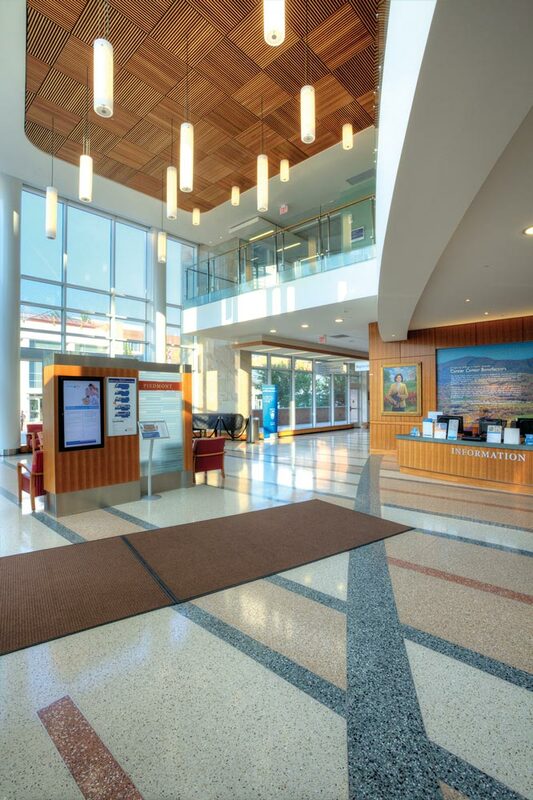 “There are a number of factors that are important—exposure to natural light, noise abatement, exposure to nature, single patient rooms and ventilation,” says Rainey about what architects look at when designing a building that can positively affect patients’ health, as well as the health of staff members, from doctors to janitorial workers. Left: The first-floor clinic waiting room has a wall monitor showing landscape images. 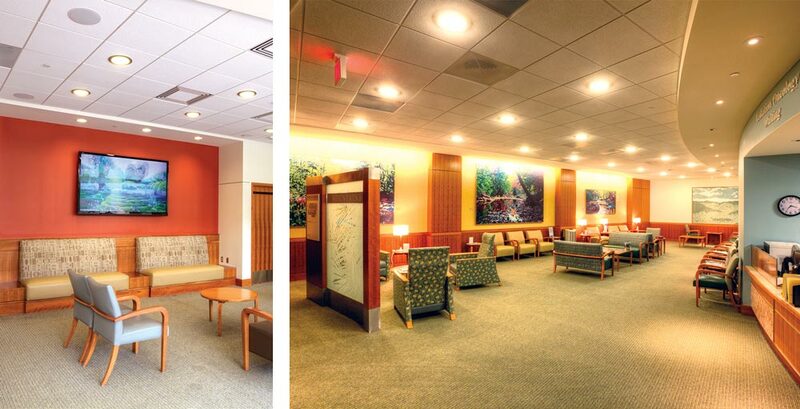 Right: The ground-floor radiology waiting room displays large landscape paintings. Nearly everyone can relate to the experience of being in an examination room with a doctor who turns his or her back to read medical records from a computer screen. This can make communication difficult and be stressful. What if there were a way to make it better? Reuben Rainey was part of a team—which included professor of architecture emeritus Theo van Groll, furniture designer and landscape architect Roger Sherry (Arch ’98), as well as School of Medicine professors Daniel Becker and Ira Helenius—that collaborated to design the “Magic Desk.” The concept? 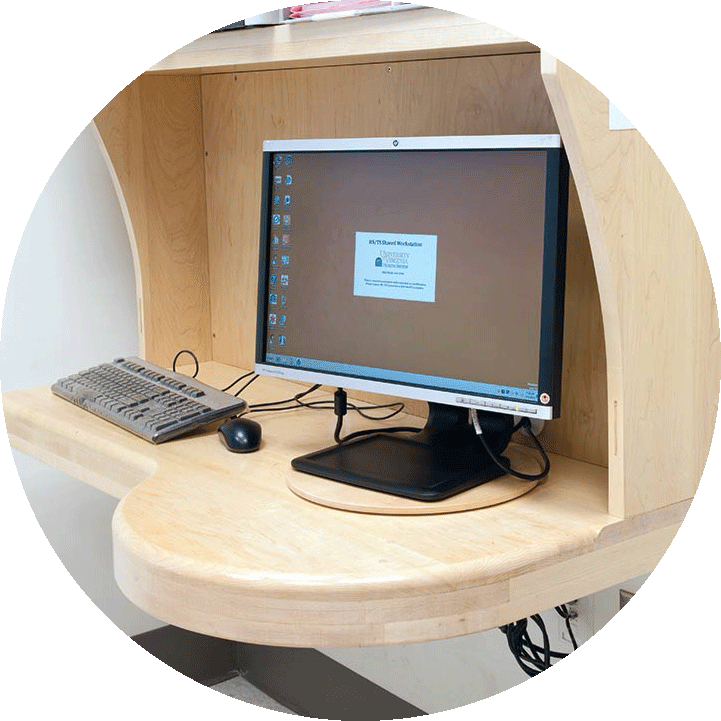 Design a desk where patients and physicians sit side by side and consult the screen mounted on a turntable. The desk was tested and the results were resounding. In 75 percent of the sessions conducted, physicians said they preferred the room with the “Magic Desk.” In fact, 80 percent said that the desk made it easier to have eye contact with their patients. 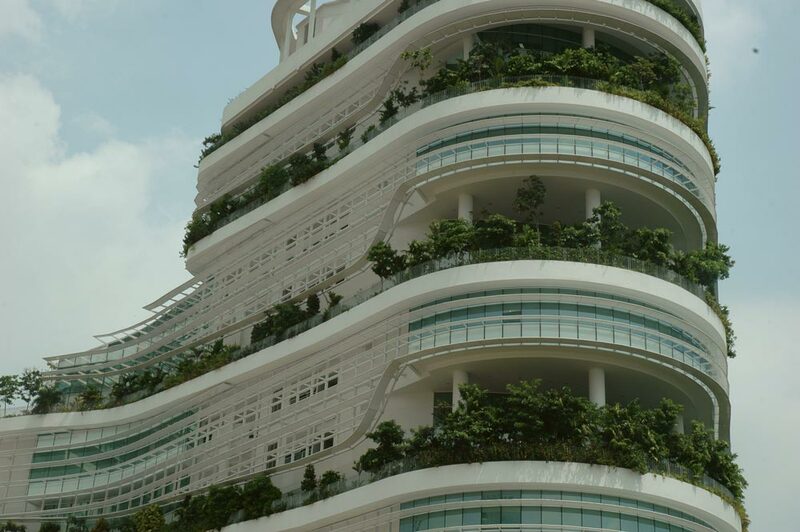 This office building, known as Solaris and designed by Malaysian architect and ecologist Ken Yeang, is one example of how new structures in Singapore seek to include greenery and nature in the vertical realm. Beatley says that there can be many challenges when it comes to improving the biophilic nature of a city. Some changes are up to the will of politicians. Singapore has been an influential partner city for the project, Beatley says, citing the city’s Landscape Replacement Policy, which includes a mandate to compensate for nature lost at ground level. Other partner cities include Wellington, New Zealand; Birmingham, England; Vitoria-Gasteiz, Spain; and U.S. cities such as San Francisco, Phoenix and Portland, Oregon. In San Francisco, planners have created parklets—underused street areas repurposed into seating, gardens or public art—throughout the city. 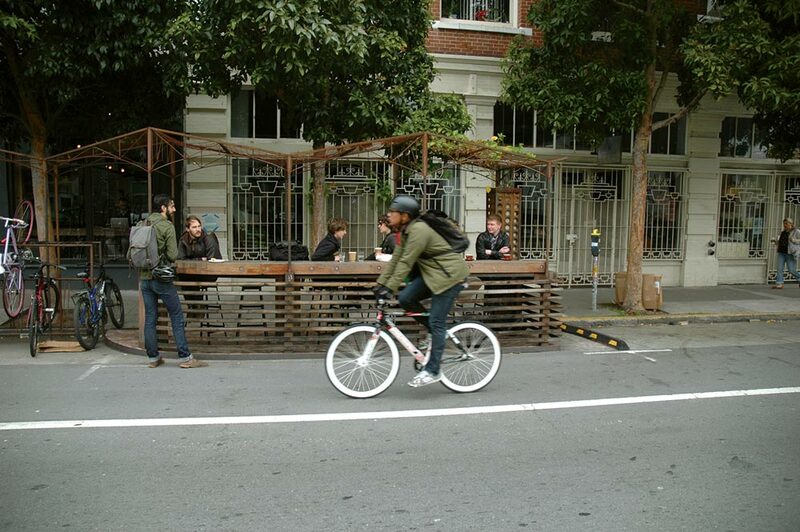 Here, rarely used parking spaces were transformed into a resting spot for city pedestrians and bikers. For many, cafeteria lunches were the punchline to numerous childhood jokes. Food would often seem inedible, lacking in nutrition, an obstinate rotation of Taco Tuesdays and Pizza Fridays. Unsurprisingly, there’s a strong correlation between the health of children and their diet. 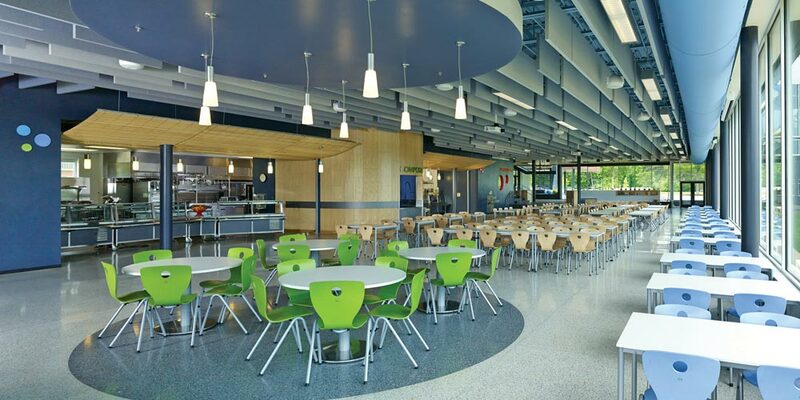 With a bit of thoughtful design, cafeterias can transform the way children eat. The new Buckingham County Primary School cafeteria has a teaching kitchen, outdoor gardens and a dehydrating food composter. There’s even an open food-serving area that gives students the opportunity to see how their meals are prepared. Carla Jones, program director at CDH, knows the impact that architects can have on the health of students. Jones notes that just an hour from Charlottesville, a project not related to the CDH but strongly connected to UVA showcases just what kind of relationship exists. In an effort to improve the health of its students, the Buckingham County Primary and Elementary schools made a number of changes to the former middle school and high school buildings. 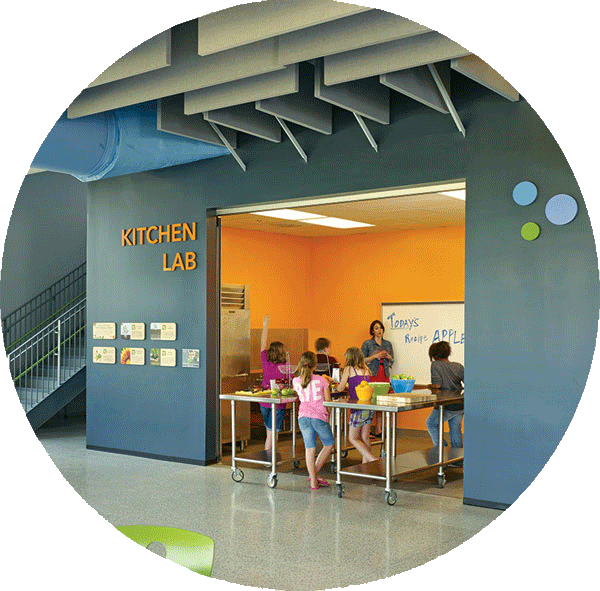 The project, finished in 2012, made a concentrated effort to intertwine education and eating. The impact of the redesigned buildings was significant. Matthew Trowbridge, an associate professor in UVA’s department of emergency medicine, and Terry Huang, a professor in the University of Nebraska’s department of health promotion, studied the effect of the renovations to the Buckingham County schools. Their review supplied a lengthy list of factors for architects to consider when it comes to the intersection of school design and student health. “Frankly, when it comes to the design of food systems, a cycle is created that promotes a healthier lifestyle,” says Jones. As she says, it just takes integrating healthy eating with their day-to-day curriculum. “You have students who are growing food in gardens and it’s food that they can cook with and eat,” says Jones. UVA physician Matthew Trowbridge worked with VMDO Architects in Charlottesville to renovate Buckingham County Primary and Elementary schools with health in mind. Open up the space. The cafeteria now contains an open kitchen, and “functions more like a demonstration kitchen,” Sorensen says. Beautiful article. Is it possible for get an electronic copy for me to foreward to a close friend who is a 1976 graduate of the University of Minnesota College of Architecture?